Located in Issaquah Highlands’ prestigious Harrison Street neighborhood, this two-level home features sophisticated contemporary design that naturally accommodates a casual Pacific Northwest lifestyle. The hillside setting offered the opportunity to place the main living spaces as well as the Master suite on the upper level, taking full advantage of the expansive views. The house plans thoughtfully set the entry well back from the street, behind a garden and pond, to create a private, welcoming transition into the home. A large vaulted space, which houses the living, dining and kitchen areas, forms the heart of this home. The space is warmed by the use of hardwood floors and naturally-finished wood beams throughout. Natural light illuminates the space through the use of continuous clerestory windows along the north and south sides. Many of these openings are motor-operable to easily access the cross-ventilation the site naturally provides. A dramatic wood and steel open-tread staircase connects the upper and lower levels. The lower level features a multi-functional space that can be used for a wide variety of family activities and opens to both a view-side deck and a south-facing entertainment area. The entertainment area creates a natural place to gather with built-in seating, a fire pit and a waterfall fed from the pool above. The lower level also houses three bedrooms, two bathrooms, and a bar and wine room. The garage is artfully hidden from view on the lower level as is the energy-efficient geothermal heating and cooling system. 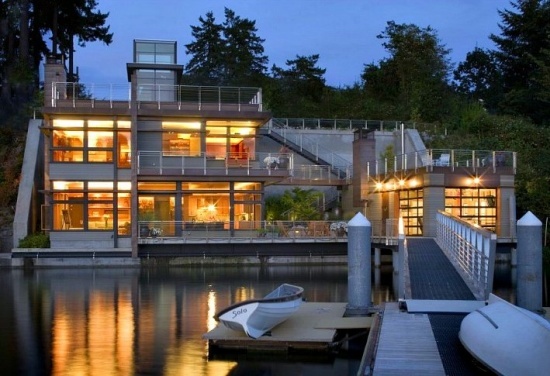 On both levels of the home the views are maximized. The inside and outside spaces flow freely from one to the other through the use of oversized windows and wall-to-wall bi-parting doors – design features that together with the energy efficient heating and cooling system and previously noted architectural design features create a timeless sustainable design. Extensive decks on both levels are built of hardwood decking and stainless steel railings for both aesthetic appeal and durability. Scott Allen, Principal Designer, Scott Allen Architecture. 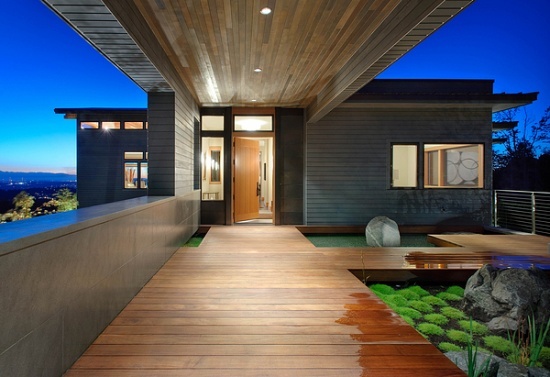 Project initiated by Olson Sundberg Kundig Allen, Scott Allen, Principal Designer. Nichole Jacobson, Interior Design.